4192 An Evening with Pete Rose Live is a Broadway style theatrical event that captures the golden years of America's pastime. Baseball's Hit King, Pete Rose, shares stories of baseball's past as only Pete can. This production uses hi-tech multimedia that creates a gameday atmosphere. The stage will be transformed into a field of memories. The audience will be transported to the golden era of Baseball. The show is set in a baseball atmosphere. Complete with all the trappings of a World Series game including the First Pitch, Star-Spangled Banner, and of course introductions. Storytelling, enhanced with visuals, will make the audience laugh as well as be inspired by Charlie Hustle. Pete Rose is an American icon. In this show, he tells it all. Pete takes you inside the game of baseball as no other person can. 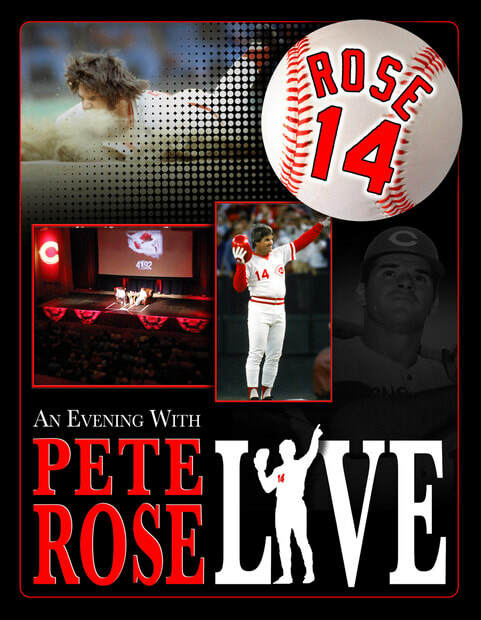 4192- An Evening with Pete Rose Live is a Home Run!